In our Instagram feed, we sometimes share RTW (ready-to-wear) looks that we come across that would be easy to recreate with a Blank Slate Pattern. Here is one way to interpret the Austin Tee pattern. 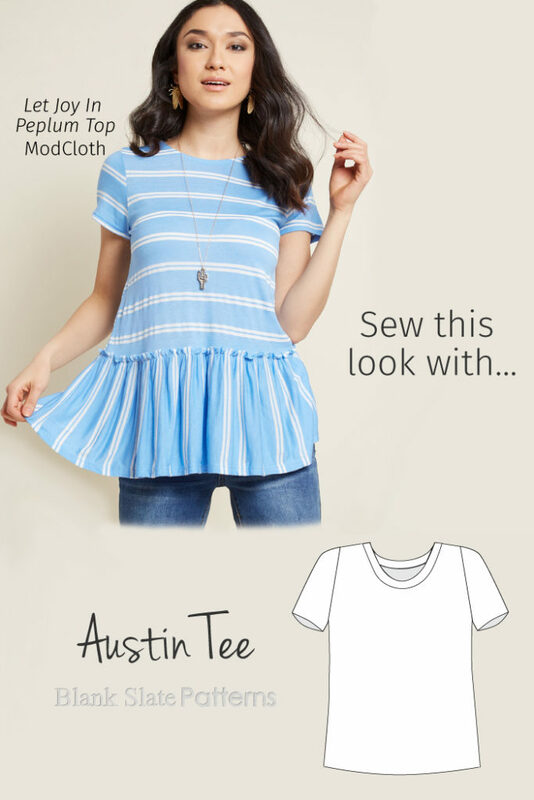 A fun and flirty look for the Austin Tee! This ruffle hack is simple, and I love the look of the multidirectional stripes. To recreate the inspiration look, use a horizontally-striped fabric (stripes running selvedge to selvedge). 1) On your front and pattern pieces, draw a new cutting line 7″ (18cm) from the existing bottom edge. Trace the new pieces or trim off the area below the line. You can always tape the pieces back on later, to keep from having to reprint. 3) Measure the bottom circumference of your tee. Take that measurement and add 1″ (2.5cm). That’s your width. Then add 1″ (2.5cm) to the length you cut off from the original pattern; that’s your length. 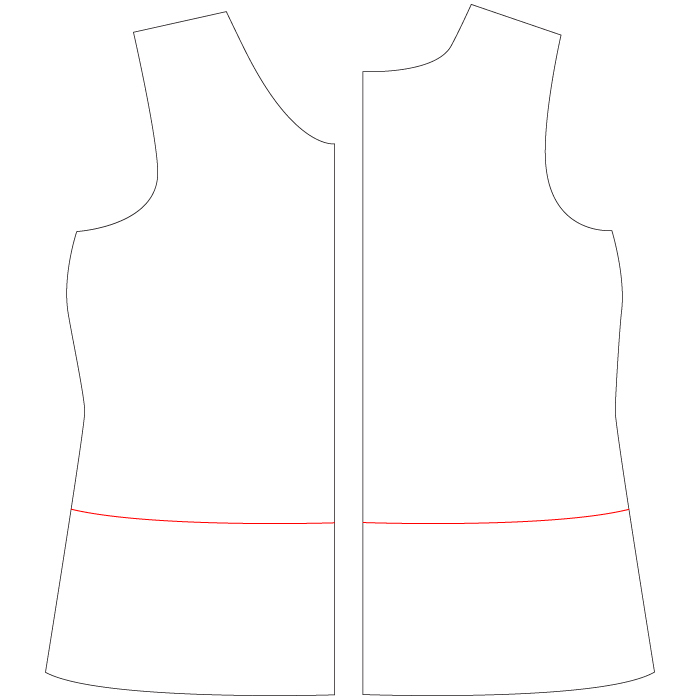 Example: The circumference of the bottom edge of your tee is 40″, and you trimmed 7″ off the pattern in step 1. The dimensions for your ruffle pieces will be 41″ x 8″. 4) Cut two pieces of fabric to these dimensions for your ruffle tier. You’ll cut the pieces with the longer edges parallel to the selvedge. 5) Sew the two ruffle pieces right sides together along the short sides. Make two lines of gathering stitches along the top edge of the assembled ruffle piece, 3/8″ and 5/8″ (10mm and 16mm) from the raw edge. Gather around evenly, to the same circumference as the bottom edge of your tee. 6) Pin the ruffle to the lower edge of the tee, with the right sides of both facing out and the ruffle on top. Align the top raw edge of the ruffle with the marked line from step 2. Also, align the side seams of the tee and the ruffle. 7) Stitch in place, 1/2″ from the top raw edge of the ruffle. Remove all gathering/basting stitches. 8) Hem the bottom of the ruffle. Done!